It's probably a reasonable guess that 99.9% of all the WYD pilgrims don't know that today is the feast of someone who should be one of the patrons of WYD in Madrid! Why? Because today is the feast of Bl. Mannes, brother of St. Dominic! 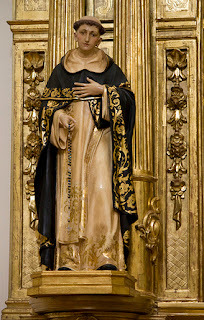 After St. Dominic founded the monastery in Madrid in 1218 we know that he sent his brother, known as both a zealous preacher, a humble and gentle man and a deep contemplative, to care for the material and spiritual needs of the fledgling monastery. The nuns at the Monasterio de. Santo Domingo on the Claudio Coelho has had an uninterrupted existence since that time although they are living in a monastery built in the 1800's. They also have the honor of having the only verified writing of St. Dominic which is a letter written to their new community. They still have the original letter in their possession! This letter is one of the choices for the Matins reading for the feast of Bl. Mannes. Friar Dominic, Master of the Preachers, to the Beloved Prioress and the Entire Community of Nuns at Madrid: Health and Daily Progress. Benedict XVI to young religious "Thank you for your generous, total and perpetual 'yes'"